In the first posting of this two-part series, I went no further than the hallway in our tour of the home. I certainly appreciate that everyone’s kitchen or bath is going to be a different starting point, so I’ll stick with some of the basic fixes that can be introduced to make an older adult’s home easier to navigate – and safer. Kitchen. The first rule is to have ample clearance under all working surfaces such as sinks, stovetops and counters so that an adult in a wheelchair can access those surfaces. Even in homes where the older adult is not yet confined to a wheelchair but may use a cane or walker, this can be a forward-looking refit to enable greater independence longer. New kitchen innovations also make it possible to elevate dishwashers for easier access among residents who have difficulty stooping to conventional machines’ levels. Microwaves and ovens can also be brought down to more accessible levels. And make sure there is enough storage or pantry access at levels that a resident in a wheelchair can reach. Anticipating the same accessibility throughout the house, engage an electrician to lower all switches and outlets to a height of 36-40″ off the floor. And as with the light switch I had mentioned in my last blog, using rocker switches makes them much easier for an older adult to manipulate. Also a general recommendation: make halls, doorways and room spaces wider for easier maneuverability. Appreciate also the poorer visual acuity of an older adult, and be sure to have ample lighting throughout the house. Bath. Some of the same principals for the kitchen also apply in the bath room. Make sure cabinets can be accessible by lowering them on the walls, and create clearance under sinks to enable wheelchairs to maneuver. Lower the mirror over the sink so that a seated adult can see themselves. 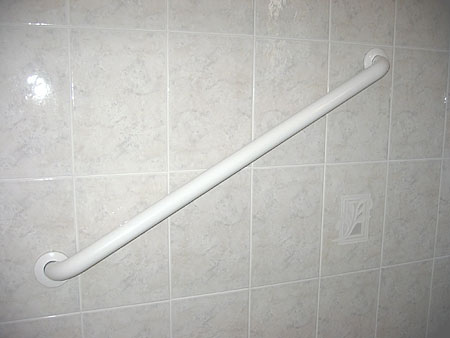 Showers and baths ideally should have flat thresholds for easy access for a wheelchair or walker. In the shower, consider either multiple shower heads at different heights or a shower head that can slide up and down along a vertical bar. 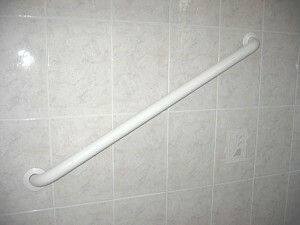 Grab bars also should be strategically installed near commodes and alongside bath tubs. Bedroom. Here is another place to have less clutter for the resident using a wheelchair or walker to have easier maneuverability. Rocker light switches all round at 36-40″ again will be important as will having a light switch within easy reach of the bed to avoid accidents when an older adult might otherwise be forced to get out of bed in the dark. In closets, have hanging bars at levels that are reachable from a wheelchair as well as the conventional higher level.